Our first trip with Grand Circle is off to an amazing start! After an uneventful flight (and these days, uneventful is about as good as it gets), we were met at baggage claim by a Grand Circle representative who escorted us through the airport to meet our driver. What a pleasure not to have to hang around the airport waiting for other travelers to arrive. Although we hit big city morning traffic, our driver took some “sneaky roads” that not only got us to the hotel quickly, but also gave us a little extra tour of the eternal city. Anna, our tour director, was waiting in the lobby to greet us. When I expressed surprise at her American accent, she explained that she learned English in the USA. She IS Italian (and Greek), but it turns out her dad was a “rocket scientist” who worked on the lunar rover in Huntsville, Alabama. No, she did not have an Alabama accent. And despite graduating from Harvard, she doesn’t have a Boston accent. Before the trip began, Anna had communicated with us via email, asking what we particularly wanted to see and do during our time in Italy. Although the group is big, (42 travelers), we are already experiencing the kind of attention you get with a much smaller group. Much to my amazement, we weren’t tired after our overnight flight, so Anna gave us a map, marked the places we wanted to visit, gave us great directions and off we went. 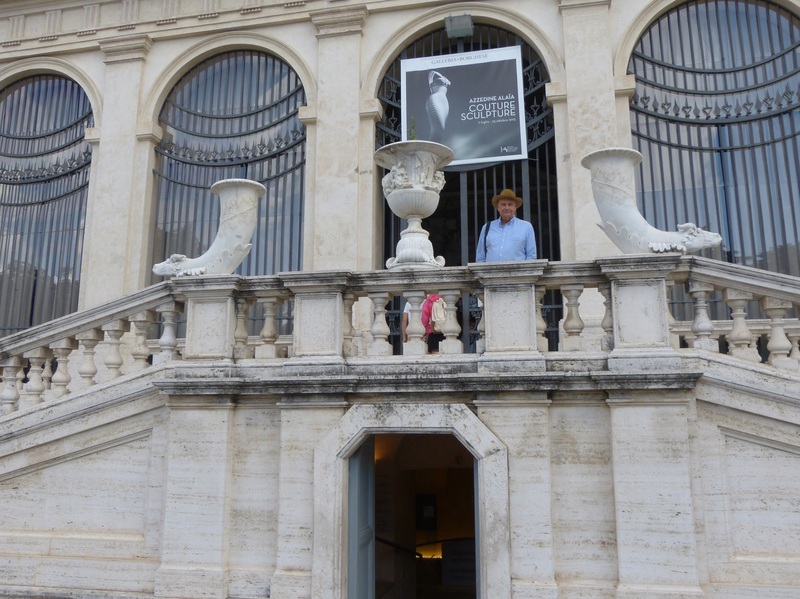 The Hotel Albani is close to the Borghese garden, so we strolled through it on our way to the Museo Dell’Ara Pacis, one of the “not to be missed” places on Mike’s list. The birthday boy, doing his Borghese prince imitation. Anna directed us to an overlook that provided a fantastic panoramic view of the city. But today wasn’t just museums and statues. We also people watched. I continue to be fascinated by the ability of women to navigate cobblestone streets in unbelievable footwear. After a late lunch at a sidewalk cafe, and a detour to the Spanish Steps, we hiked back to the hotel for a quick nap and a peek at CNN for an update on the pope’s visit in Washington DC. Time to meet the rest of our group for an introductory drink. Good to know you’re there safe and sound- gorgeous photos as usual — bring us along. More photos of you and Mike please. lovely post, Shelley! Makes me wish I were back there! It would be an even better trip if you and Marilyn were here. 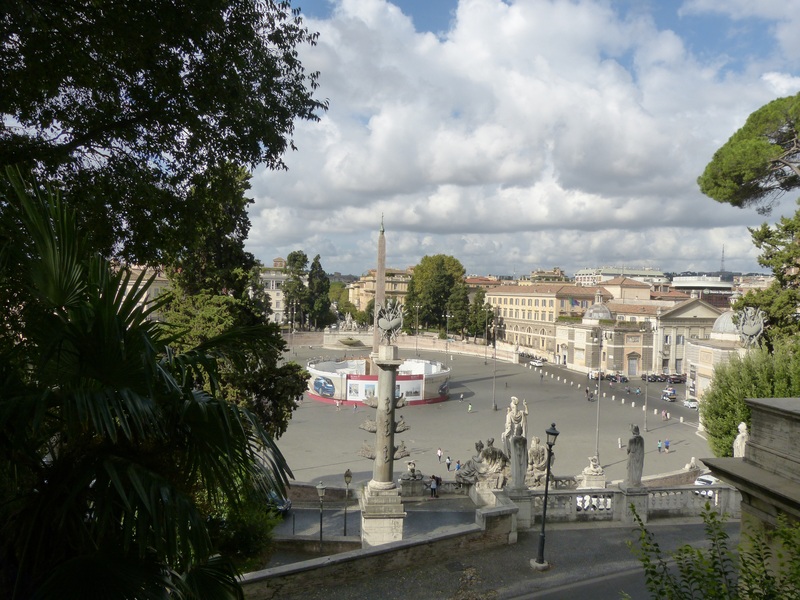 Rome – how wonderful! I am looking forward to hearing and seeing more of your birthday trip. Wish Mike happy birthday for me please! The wifi here is a bit of a challenge. I’ll try! Love following along on your many adventures! It sounds like you are off to a great start! I’m looking forward to your posts and pictures as you move along. Hi Janis, great to have you along for the ride. Previous Previous post: Happy Birth Month to You!